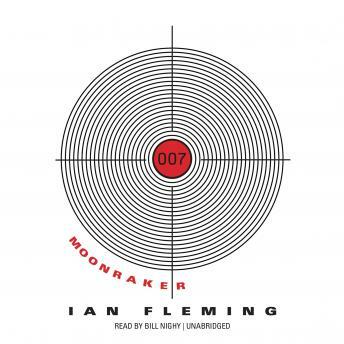 Listen to "Moonraker" on your iOS and Android device. The Moonraker project has a millionaire backer, the war hero Sir Hugo Drax—a man who, it seems, cheats at cards. With a ballistic rocket at stake, Sir Hugo’s exposure could threaten Britain’s latest defense system, so James Bond is asked to investigate. Moving from London’s most exclusive gambling club to a missile silo on the Channel coast, 007 and his Special Branch assistant, Gala Brand, discover there’s more to Drax than meets the eye. This audiobook includes an exclusive bonus interview with Bill Nighy. Published By Blackstone Audio, Inc. James Bond and 007 are registered trademarks of Danjaq LLC, used under license by Ian Fleming Publications Ltd.